Wood Processing | Wood Waste | Lumber & Things, Inc.
About Lumber & Things, Inc. Started in 1986, Lumber & Things, Inc. has become one of the largest wood processing companies in the northeast. A workforce of more than 250 blue- and white-collar employees processing 20,000 pallets per day. We have state-of-the-art and fully automated equipment to produce. We employ a courteous, honest, and knowledgeable sales staff. We believe you will experience complete satisfaction with each member of our staff. We have trained personnel to assist our customers in designing products that are functional and reasonable in cost. Our goal is to provide you with the best products and service available at a cost that fits your company’s budget. This is a service in which our company has a unique advantage because we can offer both new and reconditioned products. 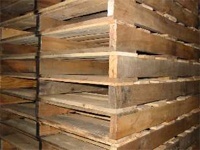 Being an “environmentally friendly company” means we recover and process wooden pallet and container components to repair and remanufacture wooden pallets and packaging. We also recover other related recyclable products such as paper, plastic, metal, and wood waste and convert them into resalable consumer products. Our entire organization is committed to providing the best quality and service available to our customers through the use of state-of-the-art machinery and industrial innovation to ensure that we are working in the most efficient and competitive means possible.